Imagine if you could look back on the many different versions of your former self that make up who you are today. Being able to see what your concerns and interests were at various ages. Without consciously trying to, I gave myself that ability. All because my mom told me to keep my drawings in a folder when I was eight years old. 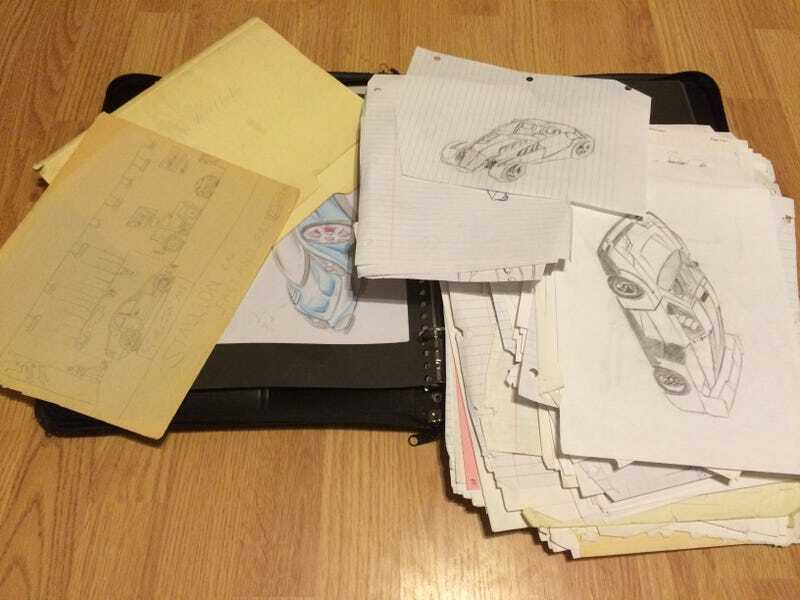 I started drawing very young, and I almost always drew cars. I have hundreds of car drawings. I’m not kidding you, hundreds. Drawn on the kitchen table on the back of junk mail, in between classes on the back of assignments, on the back of paperwork bored at a doctor’s office. Some of the drawings were on very cheap paper that has now “yellowed” considerably like what you see in the upper left and below. Eight year old me drew in 2-D and usually in the style of an advertisement or a brochure. I was influenced by the advertisements I saw in my dad’s car magazines. It wasn’t enough just to draw cars, I wanted to make my own. But they started out as just modified Mustangs usually. I was from a Ford family and eight year old me thought the Mustang was the best car in the world. As I started to learn more about the world outside of my immediate surroundings filled with old Ford parts, my interests changed. Along with my growth in interests, my skills grew too. Below is an early attempt at a three dimensional drawing. Making the transition to 3-D was really difficult for my younger self. Bear in mind I didn’t trace, I always tried to draw from what I saw in my head. Then what I saw in my head began to outgrow my surroundings. Putting my ideas on paper was frustrating though because I felt like my ability to come up with ideas was outpacing my development in skills. So I started to draw all the time. Sometimes in class even, which would get me into trouble. Drawings wound up on loose leaf paper and on the back of homework assignments. Then one day I came back home from middle school with this. I called it the DFI 500, DFI standing for “dual frame inspired.” I’d like to say 500 was for the assumed horsepower, but really I just used 500 because it sounded cool. Probably ugly to you but my parents were stunned, especially when I talked about the whole dual frame inspired concept behind my design. They had no idea how to foster my creativity though. Neither of my parents or any of my grand parents had been to college, everyone did something blue collar or entry level. I did have a technical side as well as an artistic side. I wanted to control every aspect of my designs down to the placement of every component. It wasn’t enough just for my cars to look good, I wanted there to be purpose behind the shape. My math and science grades used to be just okay but then became my strongest subjects once I realized their importance. What you see above is pseudo-science from a high school student that just had an idea of what aerodynamics are. F1 style nose with LMP style front splitter and fenders, covered rear wheels for streamlining, rear bi-wing that was somehow better for being a bi-wing, and vents everywhere. I saw features on race cars and emulated them without completely knowing why those features were there. I was continuously learning though and my thirst for knowledge was drawing me closer to engineering and away from art. Still, I wanted to be a car designer and be involved with the artistic aspects of automobile design and not just the technical aspects. Then one day, my dreams of being a car designer were deflated. With permission from my school and encouragement from my guidance counselor, my dad and I went to the SEMA show in Las Vegas with plans to visit the Art Center College of Design in Pasadena. Las Vegas was mind blowing to a seventeen year old, let alone the SEMA show. But my trip of a lifetime ended with a harsh reality check. We visited Art Center and I took my drawings to an administrator. He reviewed them and said I wasn’t so much a designer as I was an “illustrator.” He tried in the nicest way possible to say I didn’t really have an ability to come up with original thoughts. He recommended four years of night school before coming back. The walk out of their was so sad. I looked backing thinking this is a world I could never be involved in, no matter how badly I wanted to be in it. I no longer felt talented or creative, and I concluded it was probably best if I just stay away from art altogether. The drawings stopped for a while. I went into engineering which honestly has a much better job market then design or pretty much all of art. As I absorbed more technical information and skills, I realized how much of it related back to cars. I didn’t have to stop designing cars just because I was just an “illustrator.” I could be an engineer and be a designer. So why share all of this with you? Through most of my life, my creativity and thirst for knowledge was always expanding. Now I’m at a stage in my life where I feel my creativity is waning, being chocked by reality and practical thoughts. I don’t want my dream to die. I still want to be a car designer. And when I post my drawings here on Oppo amongst other car enthusiasts and artists, I feel like a car designer. Everyone here loves cars, and some of you are excellent artists, much better than myself. You all inspire me to keep trying.